Chances are that you will be far more familiar with Brian Eno and his work than you might realise. Whether you know him as a founding member of the gloriously influential 1970s art-rock outfit Roxy Music, or as the inventor of ambient music, in one breathless career Eno has actually released no less than 25 solo albums and contributed to countless projects and collaborations, but also left his fingerprints on dozens of seminal albums as a producer – think U2, Talking Heads or Coldplay, to name but a few – composed several film scores not to mention the start-up theme for Microsoft’s Windows 95. All of which is to say that it is hard to not be in earshot of his musical influence in one way or another. What’s more, Eno’s activities and ideas have spread beyond music and into visual arts, writing, teaching, political activism and even app design – the diversity of which illustrate above all else his nature as a true polymath, driven by a seemingly unbounded energy and a deep curiosity for the world around us. So we didn’t hesitate for one second when the opportunity presented itself to have one of his daughters, Irial Eno, talk to him about the effects of time, technology and music from a very personal viewpoint, weaving in along the way themes of parenting and teenage rebellion, in a conversation that couldn’t be more charming and intimately universal – and seemed to perfectly reflect this typically Eno-esque fashion of approaching familiar issues from an unusual perspective that feels so effortless and yet so substantial. Or, to put it simply: it is a joy to have someone as eloquent and charming as Brian Eno grace this latest issue. With mono.kultur, Brian Eno talked about the impact of technology on culture, the similarities between producing music and parenting, and why they called Elvis ‘The Pelvis’. 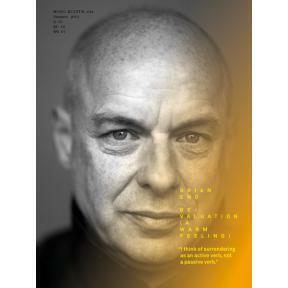 Given Brian Eno’s interest in how art can affect moods and emotions, our new issue turned into somewhat of an experiment in chromatics, with the pages gradually traveling the entire colour spectrum from yellow to blue and back again, which not only affects the optical perception of the yellow text, but also how one responds to the content of the interview. Suffice to say: this must certainly rank as the most colourful mono.kultur to date.